Wikipedia Commons, 8/25/2015 "The Puppy"
People are careless and often, when facing someone with a cancer diagnosis, can say careless things. Most of the time, it's due to being clueless and most of the time, there is a degree of well-meaning sentiment behind the careless statement. But then there's the sheer stupidity that comes out of people's mouths. "The dog breeder has decided I can no longer have the puppy that I have paid for as I have cancer! I was speaking to her to organize transport for him. She refused to send him down for another few weeks because he was "unaccompanied!" The pet transport guy said it was rubbish as even if I flew up I would not be accompanying the pup. I asked that she be reasonable regarding dates as I was having chemo. So then today she said I lied to her! Didn't realize a person had to divulge their medical issues to buy something." My friend had asked all the right questions regarding interstate transfer and there were no objections on the breeder's part. The breeder accepted the full payment of money (over $1,000 US) with full knowledge that the puppy would need to travel. Considering that my friend was using a professional pet transport company, there was never an issue about the pup being unaccompanied. The puppy was never going to be sitting in the lap of an airline passenger. The only reason for the cancellation of the sale was due to the misfortune of having cancer ... terminal cancer at that. My friend shared this in a support group and choice words flowed from her many friends. It took some persistence, but my friend did receive a full refund for her money. But there was no refund for the heartbreak that both she and her family experienced as their hearts were set on this puppy. They are continuing their search for "just the right dog." Yes, there were probably legal ramifications that could have been pursued, but it gets down to this ... when you are living with cancer, trying to live as normal life as possible, you just don't want to waste time dealing with lawyers and stupid people. You'd rather spend your time moving on, looking for a puppy and enjoying life. But seriously? Discrimination because you have a disease? I know there are laws in place to protect against workplace discrimination, but this is the first I heard of a sales transaction being denied due to disease. I thought I had heard it all. I recognize there could have been concern about the dog not being cared for should the owner die. However, no questions were asked. Just the statement, "You lied (by not telling me about your condition)," refusal to engage in further conversation and immediately relisting the puppy for sale. Obviously, words don't fail me, but then again, words fail me. This just shouldn't have happened. My cancer clinic. I know the reception on the right, but the scheduler on the left is new and I don't know her yet. Time. We seem to all want more of it, but we also lament how quickly time passes. We search for ways to fill our time and we search for ways to slow down and enjoy our time. We are a divided people when it comes to how best to spend that commodity that can never be regained. My son turned 14 years old today. It's bittersweet to look at the photos of his toddler years ... oh, what a challenge he was! He is now an amazing young man with a gentle heart for God and his people. My dad passed away two weeks ago at the age of 84. I thought it would be "easier" to let go, given his age, but his death has hurt the core of my being. I grieve and I wonder, "Will I be next?" and I wonder if my dying experience will be similar to his. My children start back to school next week. It literally seems like just yesterday that they finished their last school year. I had disease progression early in the summer and changed treatments. I've also undergone 20 radiation sessions which has brought on extreme fatigue. It will take about four weeks (time) to regain my energy, but an improvement should be obvious some time next week. Meanwhile, we are waiting to see how responsive the cancer is to this new treatment. There's that time thing again! I am feeling much better now than I was at the beginning of summer (no pain at all) and my tumor markers have dropped a bit, but not as dramatically as hoped for. However, I am gratefully accepting the daily miracle of waking up and being able to live a relatively normal (for me) life. I will have scans on September 15 with results given on September 17. The medical team is quite conscious of time and try not have long waits for results. You know that you've lived with a disease for an extended period of time when the employees of the medical center know you by name. The blood lab, the cancer clinic, the infusion center ... my name is known. I know their names as well, but alas, there is a lot of turnover, especially in the cancer clinic. I'm on my third nurse practitioner and she will be leaving on maternity leave soon. They all admit that losing their patients on a regular basis takes a toll on their emotions. (My doctor works primarily with metastatic breast cancer patients ... those with the cancer that kills.) Recently, the beloved scheduler in the clinic died ... and we were all stunned. The patients don't expect the caregivers to pass away first. I have a long list of things that need to be done around the house and I call them the "At least one useful thing a day" project. However, it's also important for me to remember that my being given this miracle of life isn't about the things I get done, but is about the love given to me by God, thus giving me the opportunity to love others. If my "one useful thing" is an act of love with no physically tangible result, then that's okay, too. I like to tell my children, "It's all good." They understand what I mean. It breaks down into the reality of "God is good, but life is hard" and there are few greeting cards to fill the emotional ramifications of hard times. However, we use what limited resources we have (like the condolence cards and emails I received ... thank you very much!) to express our care and concern as we share life together. I have only one-and-a-half chapters left to do in Judges. It's a very difficult book to stay in for extended periods of time. I am very much looking forward to getting to the book of Ruth! And so we wait ... and we do ... and we rest ... and we laugh ... and we love. All because He first loved us. Michelle and I were married the same year, 1997. We didn’t know each other at the time, but we walked many stages of life together. While she was a decade younger than me, we experienced many of life’s milestones within months of each other. Our daughters were born the same year and we were both diagnosed with Stage III breast cancer within a month of each other in 2012. We both had neoadjuvant (before surgery) chemotherapy. Michelle had a mastectomy with lymph node removal, while I had a lumpectomy. We both followed our surgeries with localized radiation. We were both declared cancer free at roughly the same time. We both started to work on rebuilding our bodies following the months of intense treatment. I started to experience pain in my neck and in January 2013, I was diagnosed with significant disease in multiple bones, including a broken vertebrae in my neck. My original diagnosis of Stage IIIb was revised to Stage IV. Michelle joined me in that “club” just six weeks later. Her mets were in her hips and lungs. Because the disease had already spread to an organ (lungs), her treatments were very different than mine. Her body responded differently as well. Quite frankly, it didn’t respond at all. The disease marched relentlessly through her body, creating mayhem and havoc. Michelle was hospitalized several times with heart problems and a plethora of other difficult health crises. I’ve not had to spend a night in a hospital due to breast cancer and the cancer in my body has responded reasonably well to treatments. While it moved into the liver in May 2014, it is being held relatively stable for now. Michelle died on December 21, 2013, at age 40. I am still living a fairly normal life. Her 18th wedding anniversary would have been yesterday. She didn't get a fairy-tale ending. Our side-by-side walk (on opposite sides of the country) took an abrupt fork in the road and a major question remains: Why? People with Stage IV breast cancer have a myriad of emotions that are seldom (if ever) addressed by the pink ribbon movement. The pink ribbon tends to focus on the lie “early detection saves lives” (It doesn’t … it simply means you start treatment earlier. Innovative and effective treatments save lives; yet, most of the money raised by the pink ribbon movement goes into “early detection, education and awareness.”). Metastatic breast cancer patients are told to have hope. The pink ribbon touts hope for all. However, hope isn’t what Michelle needed. Michelle had an unusual type primary tumor (metaplastic) and while she responded well to initial treatment, it wasn’t enough. Hope did NOTHING to treat her cancer and it’s obvious that hope didn’t help her in her Stage IV treatments. We need research and we need people to donate money that goes 100% into research. Please. As you move into autumn with Pinktober looming in the near distance, consider carefully on how to get rid of the pink hoopla and be a part of real education and awareness. Michelle should still be here with her husband and daughter. She should have had more time. Pink ribbons do not cure, nor do they raise any significant amount of funds for metastatic breast cancer research. Of all that money raised by shopping (SHOPPING DOES NOT FUND A CURE! ), only 2 – 7% (depends on your source) goes into research against the breast cancer that kills … metastatic breast cancer. Let’s do more for all the Michelles out there … and the Wandas … and the Francas … and the Catherines … and the Kates … and the Shelias … and the Mary Margarets … and the Brigittes … and the Jessicas … and all 40,000 of the women (and men) who die each year in the US alone. 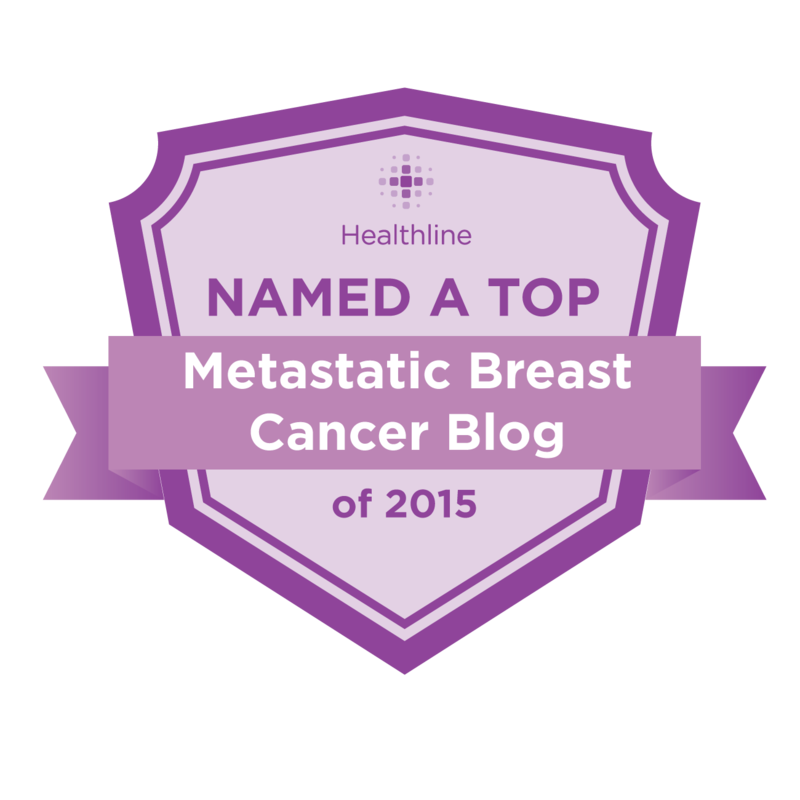 Another excellent organization that supports metastatic cancer research is Metavivor.